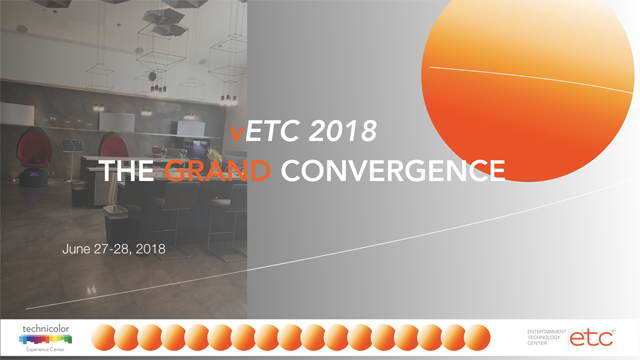 The Entertainment Technology Center @ USC hosted its fourth annual virtual conference, “vETC 2018 | The Grand Convergence” June 27-28 at the Technicolor Experience Center in Los Angeles. This year’s program highlighted talks in the artificial intelligence, immersive experience and adaptive production sectors. Thought leaders from the entertainment and service industries presented an insider’s look into the emerging technologies disrupting everything from the creative process to business models and consumer behavior. Videos from the conference are going live for viewing on the ETCenterVideos YouTube channel and include presentations from Microsoft Azure, Technicolor, Equinix, Deluxe, Amazon Web Services, USC School of Cinematic Arts and Viterbi School of Engineering. Watch your daily eblast over the next few weeks for updates highlighting the vETC 2018 videos. The first half of Day One of vETC focused on adaptive production, a broad topic that covers a lot of ground, and our speakers were as diverse as our charter. Topics ranged from new ways to think about cloud-based production, cloud security for media workflows, and the media pipeline aided by machine learning to enabling supply chains of the future and the good, bad and the ugly of OTT. We even got a glimpse of the future with glass and DNA storage technologies for long-term archives. The afternoon was all about artificial intelligence, including a fireside chat about the neuroscience of content, an interview, AI’s role in cinematography, leveraging AI in the media supply change to optimize content creation, distributed architectures, and a systems media case study. Day Two of vETC focused on immersive media (IM). Presentations on IM and health covered how VR is being used in neurological physical rehabilitation, and an approach to rating the exercise value of IM experiences. Four talks addressed the future of the story experience, including documentary, gaming, and fiction. Speakers in an independent production and finance module got into blockchain and token marketplaces, IM advertising, and the IM landscape from the VC perspective. For more information, and to check out the conference videos, visit the ETCenterVideos YouTube channel.